The ’78-’79 Atlanta Flames were the Cinderella Story of the inaugural Ultimate NHL Playoff. They pulled off a big upset with a sweep in the first round of the 26th-seeded ’08-’09 Washington Capitals. Then, in the second round, they upset the 7th-seeded ’25-’26 Ottawa Senators in seven games by winning Game 7 in overtime. However, they were swept in the 3rd Round by the 23rd-seeded ’79-’80 Buffalo Sabres, who were one of the Quarterfinalists. C – Kent Nilsson – He posted one of the best seasons for an Atlanta Flames player when he posted 40 goals and 53 assists for 90 points for the ’79-’80 Flames. LW – Bob MacMillan – One of the starlets of the inaugural UNP with the ’78-’79 Flames, he posted 108 points during the ’78-’79 season, which included 71 assists. C – Guy Chouinard – Partnered with MacMillan, the two of them were major forces on the ’78-’79 Flames in a career season that included 50 goals. The tournament begins tomorrow! 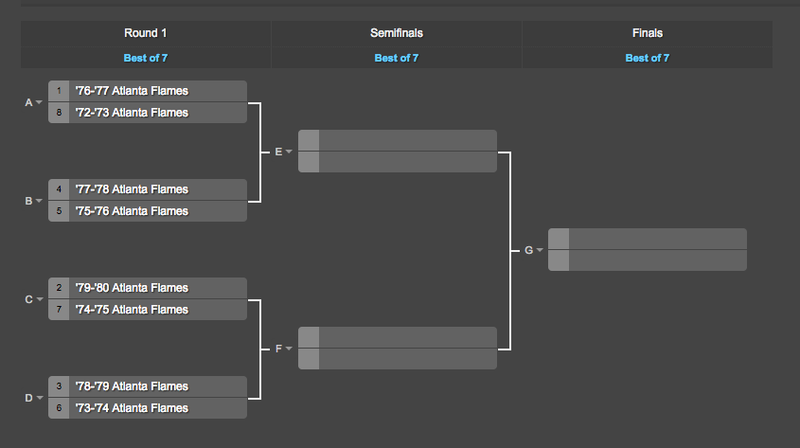 The Quarterfinals or the 1st Round will take place tomorrow and then I’ll go from there. The Semifinals may be Saturday, Sunday or Monday, I don’t know yet. This entry was posted in Qualifying Tournament, Ultimate NHL Playoff and tagged Atlanta Flames, Bob MacMillan, Guy Chouinard, Kent Nilsson, Qualifying Tournament, Ultimate NHL Playoff. Bookmark the permalink.